Computers, glitches, and technical mumbo-jumbo is what this newsletter should be titled. That is all I have to say on the matter. It's been awhile, and I do sincerely apologize to my readers. 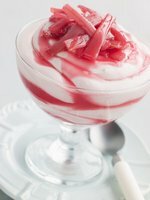 Aside from that plus a very "Happy belated Mothers Day" to all of the Moms out there, let's get back to talking about "rhubarb"..referred to as "the celery stalk dipped in red food coloring that's very tart and just like a lemon, loaded with vitamin C."
If you want to offset that sour taste, start using more honey as a sweetener. Lightly grease an 8 inch baking pan. Mix well, and spoon into your dish. Combine thoroughly, and sprinkle over baking dish. If you are, you live in a "rhubarb and radish kind of town." 30% of you grow your own veggies. Now if you are from Sacremento, you live in the "freshest" city because at least 50% of you have your own vegetable gardens. Never heard of this, but these are the results of the latest Ziplock Fresh Eating Survey. Heard of the Author Ian Clayton? He was in Wakefield England just before the famous Wakefield Rhubarb Festival to help inspire young writers. A number of ten and eleven year-old school children had the chance to meet Mr. Clayton, and he asked them do a little creative writing relating to the Wakefield Festival of Food, Drink and rhubarb. He was amazed by the quality of the work and apparently commented "there must be something in the water in Wakefield that nourishes great writers." Brothers Cider UK has launched a new cider - rhubarb and custard flavor. This was the result of a National competition to come up with a new taste, and thousands entered. Winners will tour the factory where it's being made, and win a year's supply of Brothers' Cider. Nice! You know, simple syrup or "cordial" is a great idea for having in the fridge over the summer. Equal amounts of water, sugar, and chopped rhubarb heated up in a pan, will produce this lovely pinky-red juice. Add a little little prosecco, and boy it's good. Soak a sugar cube with rhubarb bitters and place it in a champagne glass. Now top with champagne. A very nice little cocktail. Just want to wash your hands? "Mrs. Meyers" (famous for brand of cleaning products) now has rhubarb liquid hand soap out. Rhubarb works from one extreme to the other it seems. 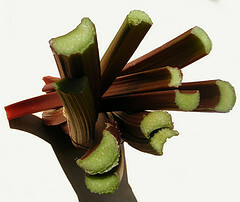 Look after rhubarb crowns if not planted yet or you are moving them. They will lose their water, and the buds can die. Dig in a trench or indentation into the bed they are going (in case the bed isn't quite ready) and put the crowns on the side with the they are going (if the bed isn't quite ready) and put the crowns buds pointing upwards. Cover the buds with soil until they are ready to be dug in. Speaking of problems, this was a question/answer I read recently in a garden blog. Question: What could have made my rhubarb plant die off? Response: If the soil has become waterlogged the plant might have succumbed to fungal infection, which has caused the crown to rot. This could have been caused by over-hoeing in the garden and the stems could be bruised or damaged, which is letting disease in. There's nothing that can be done, so dig it up and burn it." 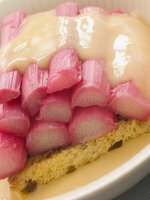 By the way, the "Rhubarb Festivals" page has been updated again for the upcoming months. Check it out for one in your area. If you have any stories or photos about the festivals you have attended, we'd love to hear.